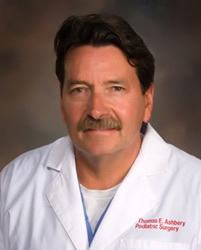 Thomas E. Ashbery, DPM - Poplar Podiatry, P.C. Dr. Ashbery has been in practice for over twenty-three years. He was a hospital trained resident, and specializes in the medicine and surgery of the foot. Dr. Ashbery's expertise is primarily surgical. He strongly believes surgery should be an option for cure, but in most cases not the first option. Initial conservative treatment where approiate is always his plan of action. Wound care, and in particular, difficult to heal surgical or trauma wounds, and diabetic wounds are another speciality of the doctor. He is board certified by the American Academy of Wound Management and is a fellow of the College of Certified Wound Specialist. Dr. Ashbery is an avid runner and has finished the New York marathon on two occasions. He invites any runners, or other athletes to come in to the office for evaluation. Dr. Ashbery has a Bachelor of Science degree from Syracuse University, and a Masters degree in Marine Biology from the State University of New York. He has also taught Biology at the University level, while pursuing his Masters degree. Dr.Ashbery's medical degree is from the Illinois College of Podiatric Medicine in Chicago. Dr. Ashbery is married and has two daughters. He is a member of our Lady of Perpetual Help Catholic Church in Germantown Tennessee. He and his family are involved in all kinds of sports including soccer, tennis, swimming, golf, and running. Dr. Ashbery's hobbies are carpentry, gardening and old auto restoration. He and his family also enjoy travel. In most cases new patients can and will be seen by the doctor as quickly as possible. Dr. Ashbery's policy is to keep some appointments open each day, for emergencies and new patients. He welcomes your visit.